As well as owning Red Oak Simmentals, George also looks after two other herds of cattle. One of these is the Red Oak Commercial Herd, these are owned by Owen Farms (Westbury) Ltd. The other herd is the very exciting joint venture between Argentine farmer Ricardo Truffer and Owen Farms, Red Oak Red Aberdeen Angus has the first imported livestock from Argentina since the Falklands war. We pride ourselves on knowing that whilst the cattle are in George's care they have a very good life. Many are classed as pets with some being very special; one in particular even had a little party on her first birthday. 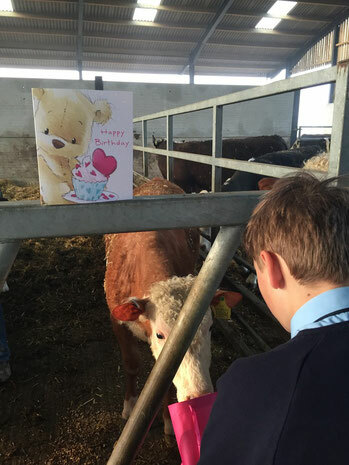 Even receiving a birthday email from her favourite vet saying "many happy returns sweetheart". Read more about our special animals in the Red Oak Commercial Herd section. We do show people around our cattle (by appointment) so come and see for yourself. We once showed a gentleman around who had been a vegetarian all his life. No, we didn't convert him but when he left he had a tear in his eye and said it was so nice to see how well the animals were cared for.